Wow. Who knew an emulsion was so enticing! Anyhow, it all started after reading a bunch of Michael Pollan books. I started reading food labels, and one of those was eventually mayonnaise. And there are some frightening unpronounceables on those labels. This was also around the time Neil and I were realizing how easy it is to make most condiments, and how much better and fresher they taste when homemade. So we dove into the world of Mayo. And it is so, SO easy. I happen to use an adaptation of the recipe in this book – I use sunflower oil, since I prefer the taste of that over olive oil for most of my mayo uses – though any basic recipe will probably do. I also use rice wine vinegar, instead of white wine. Again, go with what you enjoy. The one thing before getting started, is just trust yourself. If you think it needs more or less oil, salt, pepper, mustard, vinegar, lemon juice, go ahead and throw it in. The best part of making your own mayo is that you can really tweak it so it’s your own saucy bowl of perfection. 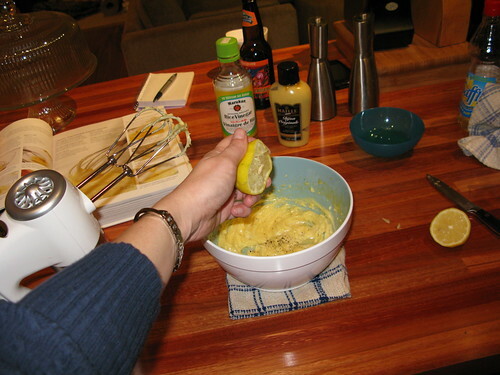 First things first: you’ll need a non-reactive bowl, an egg, oil, mustard, vinegar, salt, pepper and lemon juice. 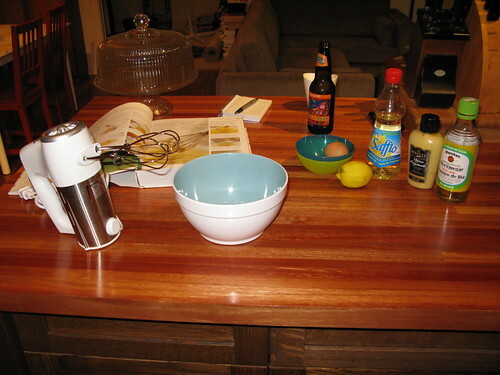 You’ll also need either an electric mixer, or if you prefer to kick-it old-school, a wire whisk and wrist of steel. Get all your ingredients (or at least the egg) to room temperature. 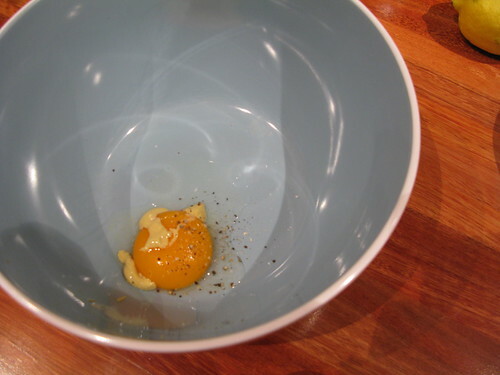 Separate the the egg, and drop the yolk into your bowl with about a tsp of mustard, vinegar, salt and pepper. You can get fancy and use white pepper if you don’t want black flecks sullying the golden yellow of your mayo, but I don’t care that much. Whisk or beat those together until well blended. Then comes the tricky part. You want to slowly drizzle in about 1/2c. of oil in a very thin stream and watch the sauce emulsify. You’ll note that my pictures of the really tricky part don’t exist. I ran out of hands. Just trust me. If it starts to split (the egg won’t absorb any more oil, and it looks chunky and curdled), stop pouring the oil and whisk like the wind! I’ve never had a problem rescuing split mayo with just extra whisking, but YMMV. 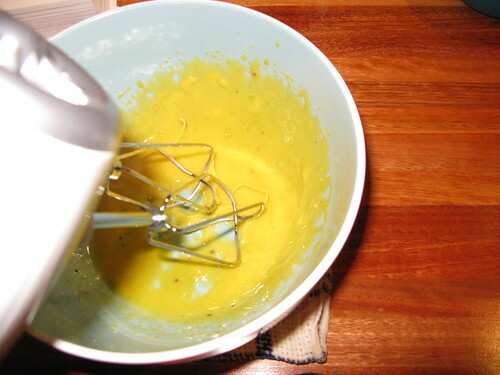 Books suggest starting with another yolk and mustard, and whisking in the split mixture until it’s all smooth again. Eventually, you’ll end up with something that looks like mayo. Huzzah! You’ve made it most of the way! But it still needs a little something-something. Add your lemon juice, adjust the salt and pepper, and give it one last gentle mix. It’s too late here to adjust the mustard, but make a mental note for next time. Once you’re satisfied with the flavour, that’s it! You’ve just made your own mayo in about 6 minutes. Give yourself a pat on the back, you deserve it! Officially homemade mayo lasts about 3-5 days in the fridge, but we’ve kept ours up to two weeks without any ill effects. 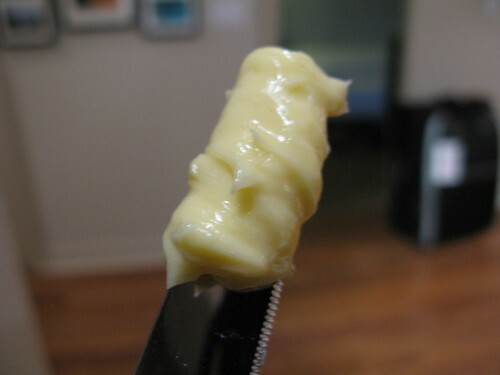 Of course, we at chez watercooler take no responsibility for any condiment related disaster or illness that may befall you after making your own mayo. And if you visit, rest assured that we only test our own intestinal fortitude with aged mayo. We’ll only serve guests fresh stuff. Now, go make yourself a sandwich! Pingback: WorldWideWaterCooler » Blog Archive » But… those are LEAVES, you don’t eat them! Previous Previous post: Oh, Hi there!